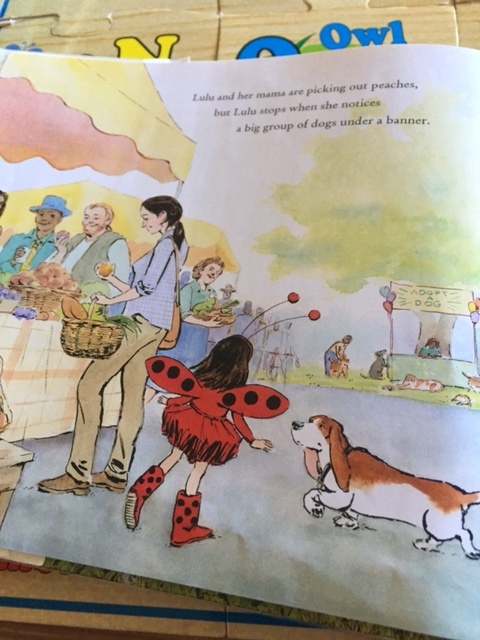 In Davis’ tale, a little girl named Lulu is out at an open market with her Mom and her dog Bingo. She’s dressed in the most adorable insect superhero costume ever. Soon, she discovers a couple of volunteers at the market who are trying to get a number of rescue dogs adopted. Of course Lulu wants to adopt them all, but her Mom explains that it would be too expensive to take care of them, plus they wouldn’t have enough room in their home. Wanting to help, Lulu asks if she can take care of the dogs while they’re at the market. 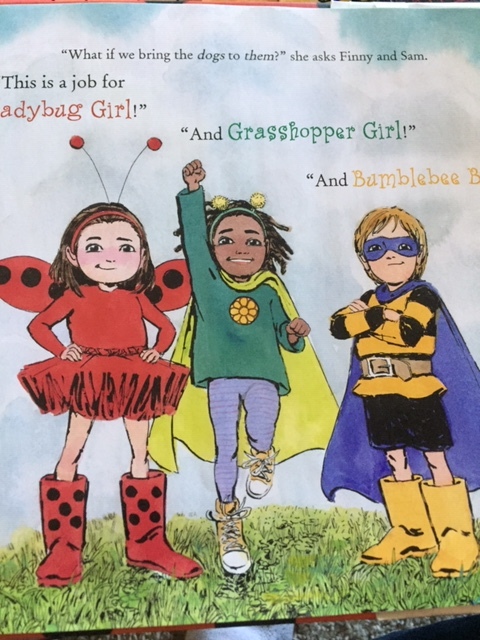 Employing her friends, the Bug Squad, made up of Ladybug Girl, Grasshopper Girl, and Bumblebee Boy, they decide to advertise the needs of the rescue dogs to everyone at the market, resulting in one dog being adopted. One of the things that got my attention as I was reading is that there were almost no men in the book. If Lulu has a Dad, he’s nowhere around. Both rescue dog volunteers were women, and in fact, the only semi-prominent male is Bumblebee boy, although functionally, the boy and girls were interchangeable. The only adult male I found who wasn’t part of the background, was the Dad in the family that adopted one of the dogs. Okay, I get that there are plenty of single Moms in the world and that very likely, this book (the tenth in a series as far as I know) was written for and marketed specifically to girls, but Dads, Uncles, Grandpas, and brothers are important to the development and growth of little girls as well as Moms, Aunts, Grandmas, and sisters. I did look up Jacky Davis’s Amazon Author’s page and discovered she’s married to the book’s illustrator David Soman and they do have children and a dog together. So why no Dad? The saving grace is that among all of the Ladybug Girl books, she did write one called The Amazing Adventures of Bumblebee Boy. The Ladybug Girl book is a charming tale. The next one is a little more unsettling. 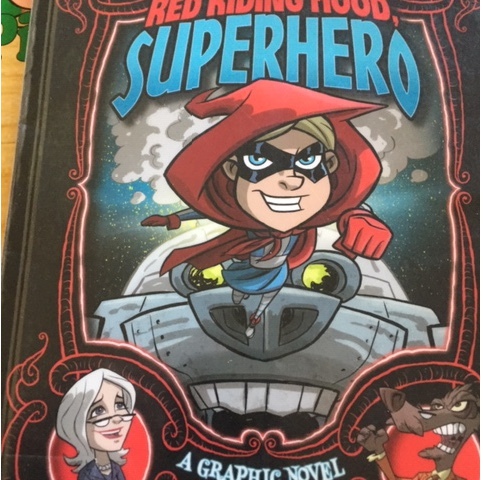 Otis Frampton‘s Red Riding Hood, Superhero is about the adventures of a little girl named Ruby who just happens to be the granddaughter of the President of the United States. 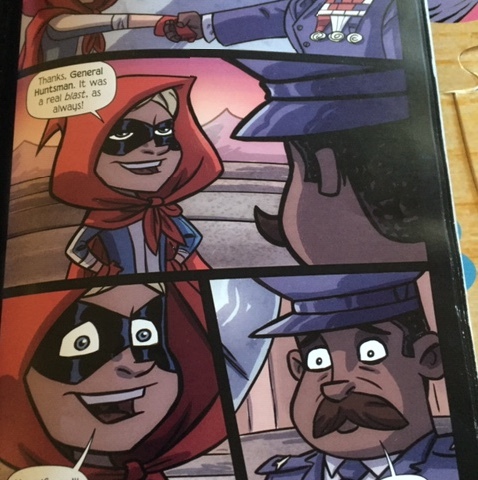 In this particular graphic novel, she’s riding in the car with her Mom on the way to Camp David to visit President Grandma (Hillary Clinton in another life?) 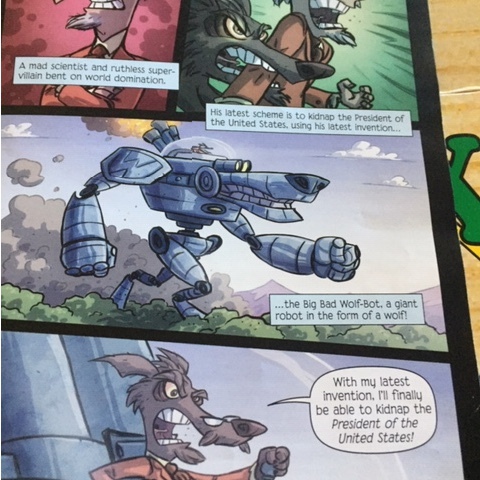 when the evil Professor Grimm, turned into a humanoid wolf by being bitten by one of the critters who was radioactive (what does that sound like), uses his giant “Big Bad Wolf-Bot” to attack the President. Ruby feigns having to go to the bathroom so she can put on her alien red cloak and become the famed superhero. She got the cloak while visiting the secret “Area 54” with her President Grandma. Wandering off unattended (year, right) she finds an alien and accidentally scares it off so that it leaves its cloak behind. Whenever Ruby puts it on, she’s invincible. She’s so invincible that, when Air Force jet fighters come to engage the Wolf-Bot, they defer to this super powerful little girl and buzz off. Not only does she defeat the Wolf-Bot and Professor Grimm with ease, she delivers them to a military base with a kindly General. Of course, all this takes time, but her Mom only casually remarks about how long it took Ruby to use the bathroom at the rest stop. The story ends happily with Ruby and her Mom having a birthday celebration with President Grandma. Yes, it’s another story where the only men around are either the villain or background characters. No Dad, no Grandpa, no other significant male presence. I looked up Frampton’s website and bio but it didn’t say anything about him personally (though I did notice that his photo and self-portrait bear almost no resemblance to each other). He does have some pretty impressive credits, so I give him props for that, but if anyone besides Brie Larson / Captain Marvel is all about girl power, it’s Frampton. Here’s my point. You want to advocate for equality, that’s totally cool. I’m all for that. But are these two books touting equality or replacement? I know what you’re thinking. You’re thinking, “Why so serious, James? 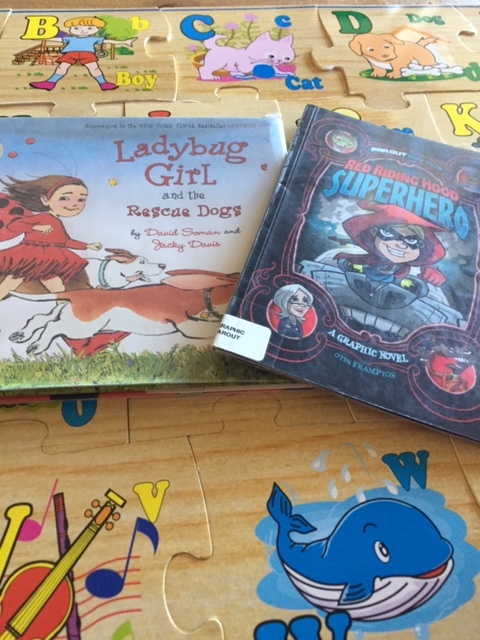 They’re just children’s books.” Yes, they’re children’s books, but ever since parents started reading to little kids, and then kids got old enough to read to themselves, books, including comic books, have been used to teach various sets of values. However, the values I read about in comic books when I was say ten are not the same as they are today when my ten-year-old grandson reads modern books. I do agree that girls can be powerful heroes just as well as boys, and that there are single Moms in the world struggling to raise their children, and yes, that needs to be exposed and available, but does it necessarily have to be at the cost of depicting boys and men in a positive light or in any light at all? Oh, I’ve wanted to write a book series for my granddaughter, who turns four this summer, for a while now, but I haven’t had the time to develop it. Maybe I need to make it a priority. After all, girls needs Dads and Grandpas, too. Perhaps the two books are some sort of reparations for the years/decades that women were pushed to the side? I guess reading them back to back kind of surprised me. Then again, I’m concerned it may indicate a trend that minimizes men in the lives of children. I see your point, but if we base the whole of humanity from what is written in two books, we are seriously in trouble. True, but then again, I’m concerned about trends. I suppose he will never grow up. I have a daughter and started noticing how almost all media has a male lead character and mostly or all male characters. I’m thankful there are some books with girls. Almost all “gender neutral” content is full of male characters staring male characters. I suppose I’m a tad sensitive as a Dad and Grandpa, but I can’t say you’re wrong. I’m all for balance, but as I mentioned to Kenneth, I still believe men are important in the lives of children. “— she gave herself a shake. ‘Pull yourself together. If you sit waiting for a prince to rescue you, you may be here forever. Be practical. If there’s any rescuing to be done, you’re going to have to do it yourself. '” And so, with the aid of a young prince also trapped in the tower, together they effect an escape. *That*, to be, is how it should be done: simple, honest, and truly equal. But somehow the industry started pandering to the winds of social desire, and that absurd Red Writing Hood rewrite (I’ve seen it; you’re being kind in your description) is the result. Hopefully, at some point, we’ll pull back from this. But it probably wont happen anytime soon. Unfortunately, over the past ten years or so, differences of most kinds have polarized which makes coming together as equals and cooperating more difficult, at least for some folks. Children’s books can have a great influence on young minds. I’m all for exploring outside the traditional boundaries, but the pendulum does seem to have swung to the feminine side…and balance is the key. Men and women are at their best when both are equally valued.